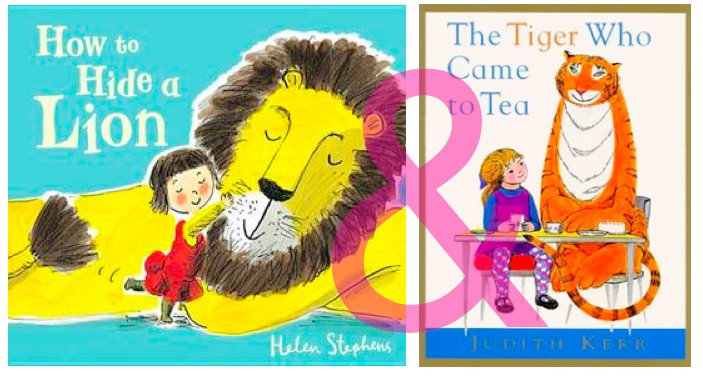 Both of these books star little girls and BIG cats. But I’m pairing them for another reason too. The recent title refers to the classic in its pages! Artwork by Helen Stephens; photo by Sharon F. Jones. “Then she read him his favorite story. It was about a tiger who came to tea. Ladies and Gentleman, that’s a literary allusion to that older picture book. The one in which a tiger comes to tea and eats and drinks everything in the house, including Sophie’s father’s beer. It makes such perfect sense Iris would read that book to her lion. It’s about a friendly tiger. It’s just as, if not more, absurd than the book in which Iris appears. I love the hunt of finding children’s books that allude to other children’s books. Recognizing a literary allusion is a bit like being in on a private joke. It adds new, deeper meaning. It’s a fun game. So here we go. When You Reach Me (2009) by Rebecca Stead (one of my very favorite books) & A Wrinkle in Time: 50th Anniversary Commemorative Edition (Madeleine L’Engle’s Time Quintet). “I’m not still reading it,” I told her. In When You Reach Me, main character Miranda’s favorite book is A Wrinkle in Time. You have to know the story to recognize those clues about it. But it’s more than an allusion for allusion’s sake. Both books share main character names that start with M, people they care about who start to change, a mystery, and a big dose of science fiction. One informs the other. 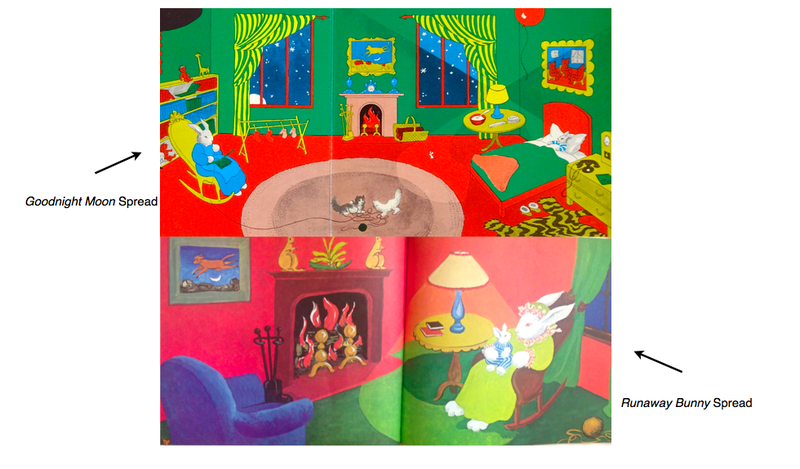 Classics The Runaway Bunny (1942) & Goodnight Moon (1947) are by the same team, Margaret Wise Brown and Clement Hurd. There’s a scene in The Runaway Bunny with Mama and Baby in a room, Mama rocking Baby to sleep and that spread forms the whole setting for Goodnight Moon. Even the painting of the cow jumping over the moon! 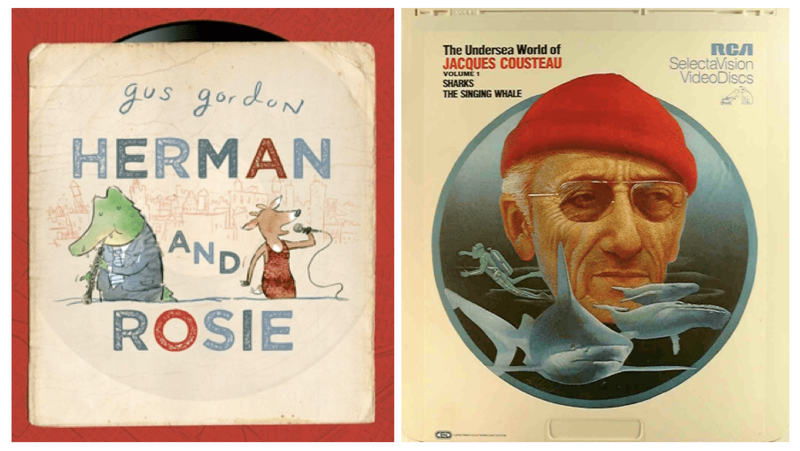 Picture book characters Herman and Rosie (2012) both watch and adore the underwater films of Jacques Cousteau. 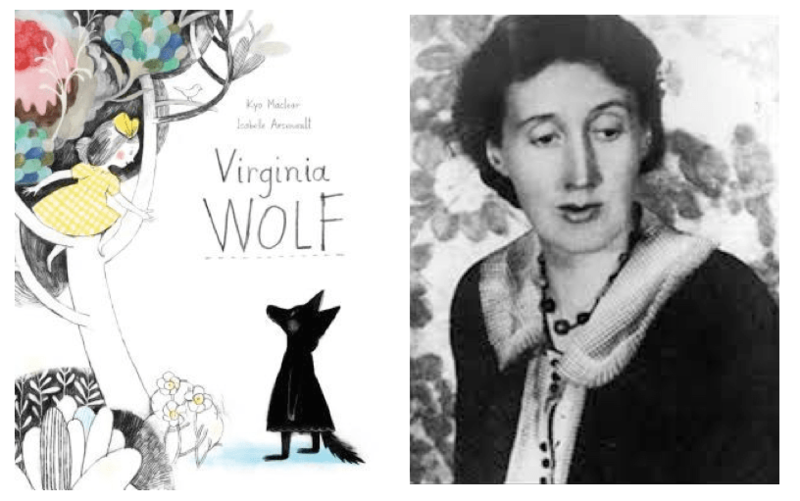 Virginia Wolf (2012) by Kyo Maclear and Isabelle Arsenault pays wonderful homage to the historical Virginia Woolf and Bloomsbury. The latest example that’s come to my attention thanks to Seven Impossible Things Before Breakfast is The Baby Tree (2014) by Sophie Blackall. 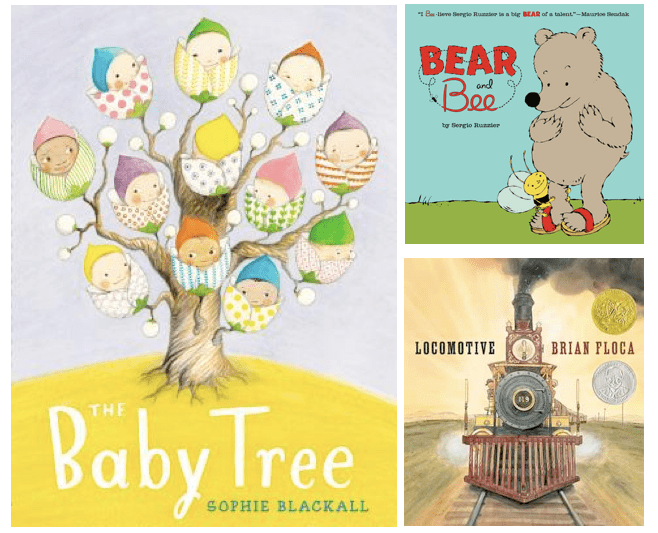 While discussing where babies come from, Bear and Bee by Sergio Ruzzier & Locomotive by Brian Floca are on the bed. And for your amusement, this video documenting the Shakespearean allusions in the Willy Wonka and the Chocolate Factory film (1971). One more? NPR has compiled a list of allusions in Lemony Snicket’s A Series of Unfortunate Events. Wild About Books (2004) by Judy Sierra, illustrated by Marc Brown references many kids’ book titles and covers! Isabella, Star of the Story (2013) by Jennifer Fosberry mentions classics like Goldilocks and Alice in a library adventure. This can’t be all of them! Do you have any to add? Children’s books that reference other children’s books? Tell us your allusions! ← please bring balloons + balloons!! “I Hate Picture Books” (2013) by Timothy Young is packed full of allusions to well-known and beloved picture books. It’s awesome! Thanks for adding that one, Lori! I have yet to get my hands on it. This is an absolutely fabulous blog post. I have been a fan of your blog for some time. I have shared the link to this blog post with my FB group – thank you! These titles are great for exploring intertextuality 🙂 Keep up the great work – it’s appreciated! I think – think, because I don’t have them in front of me – that Greg Pizzoli’s books (The Watermelon Seed and Number One Sam) would be another pair to look at! One of my favorites is in Extra Yarn. Jon Klassen’s bear and rabbit from I Want My Hat Back make a brief cameo. Oh that’s right! I wish I would’ve included that one. It’s of my favorite books that I’ll have to feature come fall. Okay, Danielle. This is simply excellent. I do this all the time when reading and love knowing others are out there checking out the fine details and allusions, too. danielle your blog is so brilliant and FUN. Thank you, Lindsay! Means a lot coming from you!!! Double allusion!! Bonus. I’m a big fan of Linda Urban’s work. In Sudipta Bardhan-Quallen and Ward Jenkins book CHICKS RUN WILD, my book CHICKEN DANCE is on the bookshelf. Thanks for stopping by here, Tammi! What a fabulous homage that is! !